Claire Marie Hodges distinguished herself as the first female ranger in Yosemite National Park (NP) and by some accounts was the first fully commissioned female ranger in the two-year-old National Park Service (NPS). She was born in 1890 in Santa Cruz, California, and grew up there. On her first visit to Yosemite NP at age 14, Hodges fell in love with the valley. She returned in 1916 to teach in the Yosemite Valley School. In 1918 near the end of World War I, finding able-bodied men to fill manual labor jobs was difficult, and women were being tapped to work in factories and other jobs. When Hodges learned that the park needed rangers, she went to the park superintendent, Washington B. Lewis, to apply. 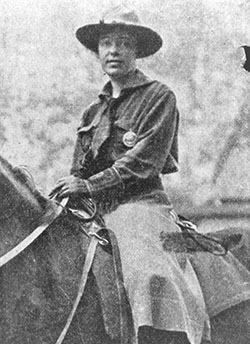 Lewis hired her as a seasonal ranger in May 1918 and she spent the summer on mounted patrol. Part of her job was to take the entrance receipts from the gate at Tuolumne Meadows to the headquarters, riding through the night. She also patrolled both the valley and more remote areas of the park. Hodges had the same duties and responsibilities and wore the same Stetson ranger hat and badge as her male counterparts, though she declined to carry a gun. After her temporary service as a ranger, she married Peter Wolfsen and stayed in the Yosemite area, ranching and guiding church groups. Though her time with the NPS was short, she helped open opportunities for women whose role in the parks had been limited. NPS Director William Penn Mott, Jr., would later praise her for refusing to accept stereotypes and having the tenacity to take on the male dominated profession of her time.